Jenn Wasner has made a ton of great music with Andy Stack under the name Wye Oak: Perhaps you recognize that band from its multiple A.V. Undercover appearances? 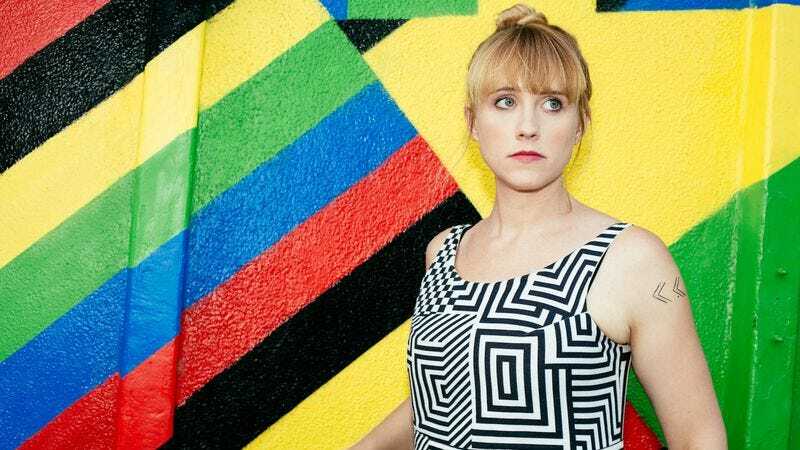 Last year, Wasner put out what was essentially a solo disc under the name Flock Of Dimes, and today we’ve got the exclusive premiere of her latest video, “Everything Is Happening Today.” It’s a colorful, geometric bright spot created by the video artists Endless Endless, but Wasner almost didn’t release it—it might be a bit too joyful for these troubled times. She even wrote a Medium piece about it, which you can read right here, but if that’s too tough a click, she sums it up well: “I’ve spent a lot of time worrying that I shouldn’t share this video, for fear that the vision of unabashed joy that it presents has become irrelevant, almost inappropriate. In the end, I decided that I would feel much worse if I didn’t. In spite of this swell of fear and hate that has permeated our lives, I think it’s important to continue to show ourselves to the world, to bring our ideas to life and allow ourselves to be vulnerable.” The essay also explains the video’s relationship with She Should Run, an organization that seeks to promote more women to public office. In addition to the video, Wasner will hit the road with her friends in Sylvan Esso (remember their Undercover, featuring Jenn?) for a bunch of late-summer dates. Can you believe we’re talking about late summer already? First, the video, then the tour dates.